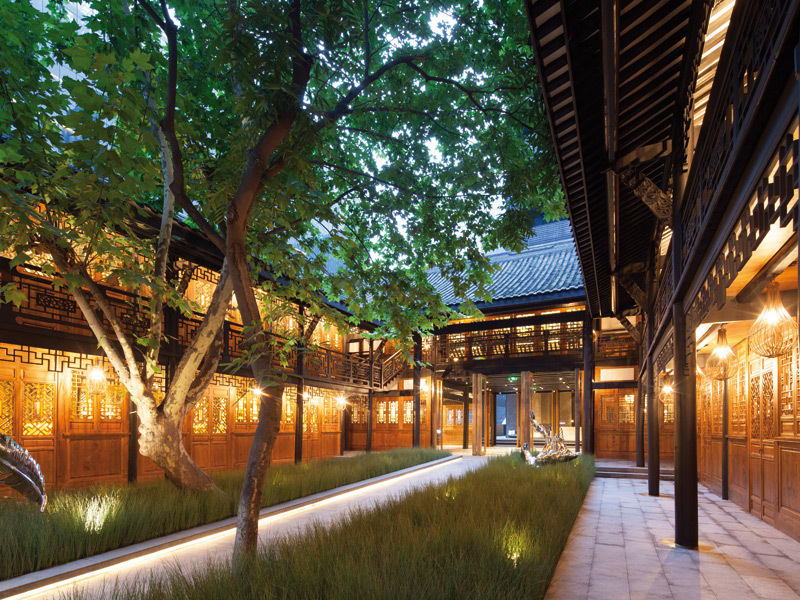 The historic two-storey Biteshi courtyard, built in the Qing dynasty, serves as an entrance way to the new hotel. Photo: John Madden. Guest services desk adds a modern element. Photo: John Madden. The hotel’s subtly lit swimming pool also has the paddy field reference. Photo: Alison Pickett. 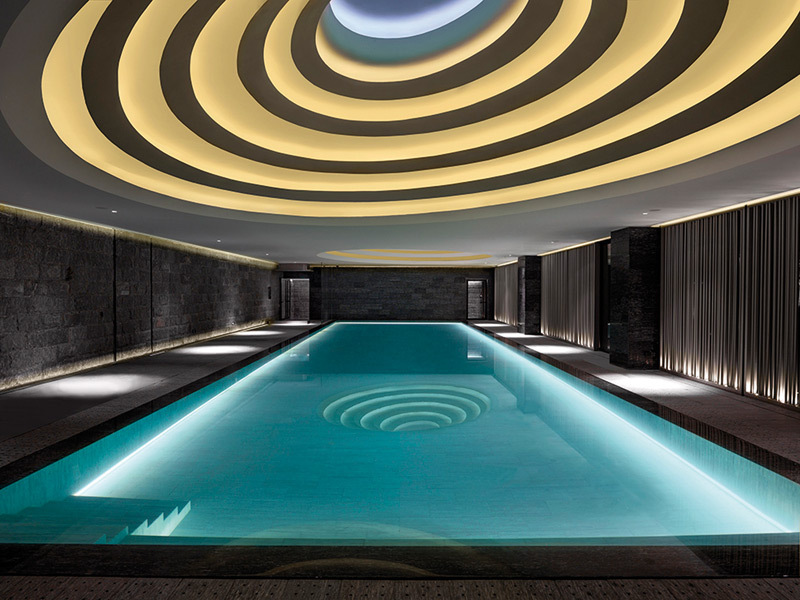 Located in the heart of Chengdu is The Temple House, a 'historically rich' hotel as designed by British architecture practice Make Architects. An ancient city, Chengdu today is one of China's major metropolises and centre of finance and commerce. The Temple House hotel owner -- Swire Hotels -- wanted to capitalise on the area's rich history as the design inspiration. The hotel experience had to be a unique one; differing from those in other major Chinese cities such as Hong Kong or Beijing. It had to be inclusive to the area and offer comforts that were not only luxurious but also 'visually and atmospherically innovative'. It is sited as part of the Daci Temple Cultural and Commercial Complex -- a large-scale, mixed-use development in one of the city's many rapidly developing urban areas -- which, as expected, features high-tech shiny architecture like in any new urban and financial development. Except this site just happens to have a beautifully restored Qing Dynasty heritage courtyard building, forming the design scheme's 'anchor' and entrance point for the hotel. The historic building's brickwork had been used to create perforations on the exterior, adding a depth to the texture; Make Architects utilised this technique on the design of the new segments of the hotel. Examining the design 'holistically', as opposed to a 'linear process', the practice created a dynamic relationship between the design of the hotel's external and internal spaces. 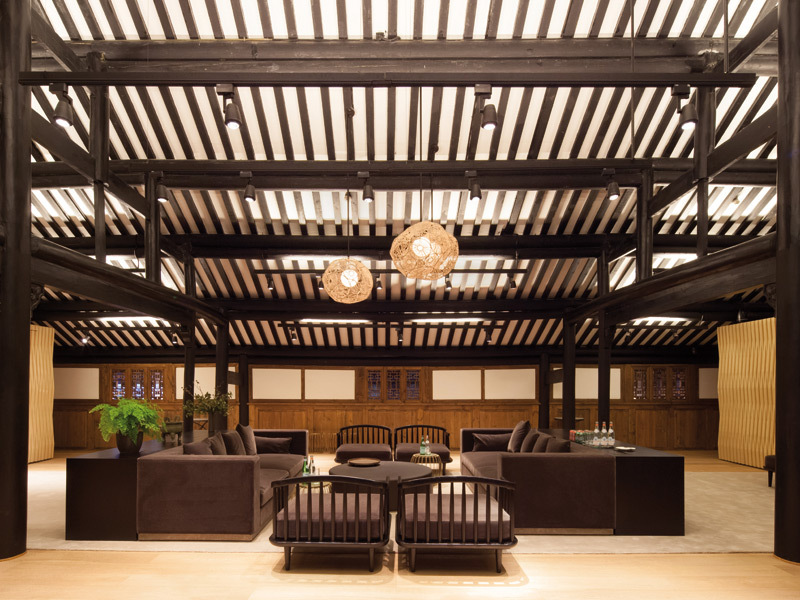 The hotel embraces a typical Siheyuan or 'courtyard house' design. A sequence of courtyard gardens, bordered by two L-plan medium-rise buildings, makes up 100 hotel guest rooms and 42 serviced apartments. Guests reach the hotel's core facilities by passing through the two-storey heritage building's internal courtyard to a reception area and enter the main hotel down a grand staircase to a landscaped courtyard level. Here are covered routes to the lift-cores for the guest rooms and apartments, as well as restaurants, cafes and other facilities. The hotel's conference room blends traditional themes with a modern aesthetic. 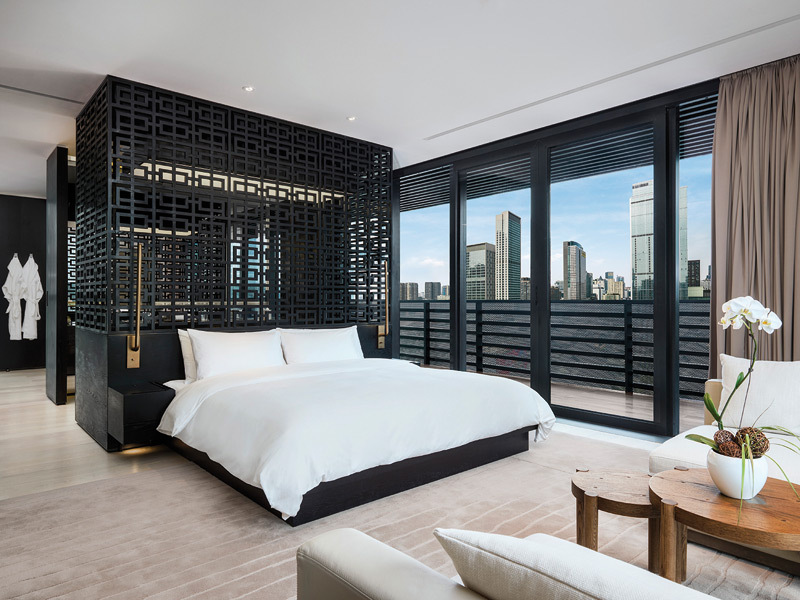 The city-facing brick facades of the hotel and apartment segments, inspired by the local production of brocade, have facade panels formed of brick and elements of black, solid, reconstituted stone lintels. The 3D woven facades combine modern design with the traditional Chengdu architectural elements of timber, brick and stepped stone. 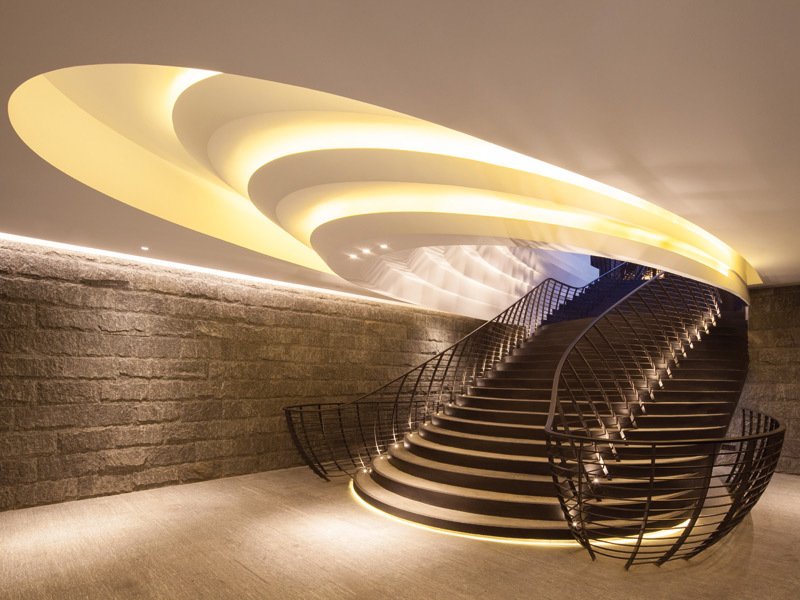 Throughout the design process, Make Architects and Swire Hotels rigorously tested visual and experiential possibilities relating to surface textures, internal light and shadow effects, and interior views. The city-facing and internal courtyard-facing facades were given entirely different treatments; the former is essentially solid and brick-built, while the latter are sheer curtain-walls of subtly fritted glass that maximise the reflection of light into the courtyard. The hotel's subtly lit swimming pool also has the paddy field reference. Photo: Alison Pickett. The light-wells embedded in the courtyard layer, organically shaped in plan and stepped in section, are reminiscent of the terraced paddy fields of Sichuan's steep hillsides when seen from beneath. The terracing effect was echoed even more dramatically in the design of the grand staircase that connects the ground floor reception area to the courtyard.